"Encourage us with the help of the Holy Spirit to use these sacred writings for our prayer and inspiration, for the increase of our own faith and devotion, and for the building up of your Kingdom." The presentation of Bibles to children is a tradition in many churches. There seem to be three different times during the year when this is most prevalent: in September when Church School classes begin, on the First Sunday of Advent, and at the end of the academic year in May or June. 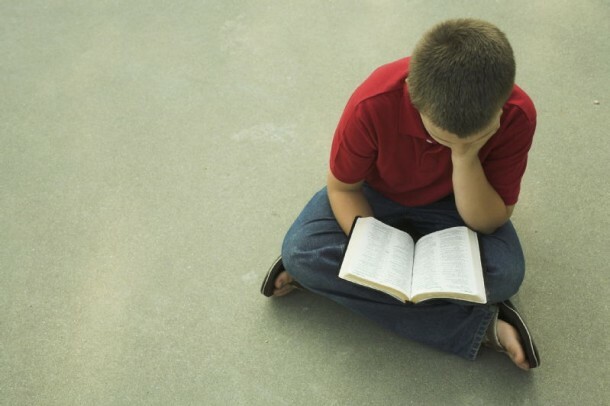 Many churches give children bibles in 3rd or 4th grade, since that is the age when they are learning the skills to be able to read chapter books. Develop a practice of presenting children a bible (a version that can remain with them as they grow older) at the beginning of the academic year. They can be encouraged to bring it with them to class where they can learn how to use it and where to find the stories they are studying. Help your teachers incorporated Bible study skills in the context of your regular curriculum. Encourage parents to keep the Bible available (and not be put on a shelf) read from it during family time, before bedtime, or on occasions of quiet time. When Bibles are presented, do it the context of your worship service. Recognize the importance of passing along the stories of our faith from one generation to another. Glue book plates on the inside cover, noting the church, location, and date. Presider: Receive the gift of this Bible so that the story of God and God’s people may be with you at home, church, or wherever you shall choose to carry it. Enjoy reading how God is at work in nature and history. Learn about the life and teachings of Jesus. Be open to how God may continue to speak to you through your reading of the scriptures. Blessed be your name, O Lord our God, You are the fount and source of every blessing! You have revealed yourself to your human creation in many and diverse ways. Our memory of your revelation is maintained and reverenced in the Scriptures that we hold in our hands. Look with delight upon us today as we renew our commitment to read and remember You in the stories of our salvation. Help us to absorb its wisdom and live its inspired truth. Encourage us with the help of the Holy Spirit to use these sacred writings for our prayer and inspiration, for the increase of our own faith and devotion, and for the building up of your Kingdom. Through your Word may we be transformed into the very likeness of Christ, your Son, who lives and reigns with you forever and ever. Amen. Sharon Ely Pearson is an editor and the Christian Formation Specialist for Church Publishing Incorporated (CPI). She is the author/editor of several books, most recently The Episcopal Christian Educator’s Handbook and Signed, Sealed, Delivered: Theologies of Confirmation for the 21st Century. When not traveling for work or pleasure, she enjoys tossing tennis balls to her year old black lab, Chobe.